With the winter doldrums in full force, I went to my local rhododendron nursery the other day to pick up spring color for a few jobs. 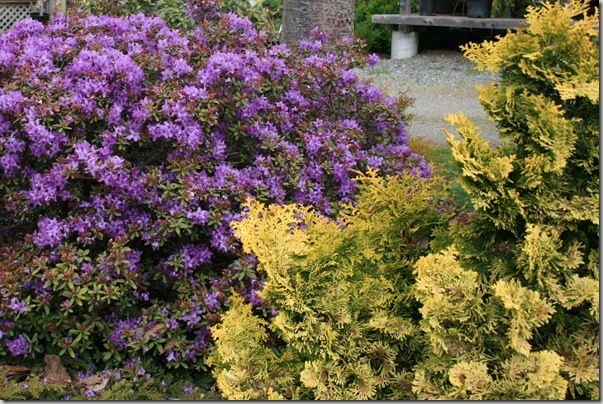 Usually, I’m blown away by the blooming rhodies or the summer-flowering heathers. But this visit, what really struck me was the conifers. 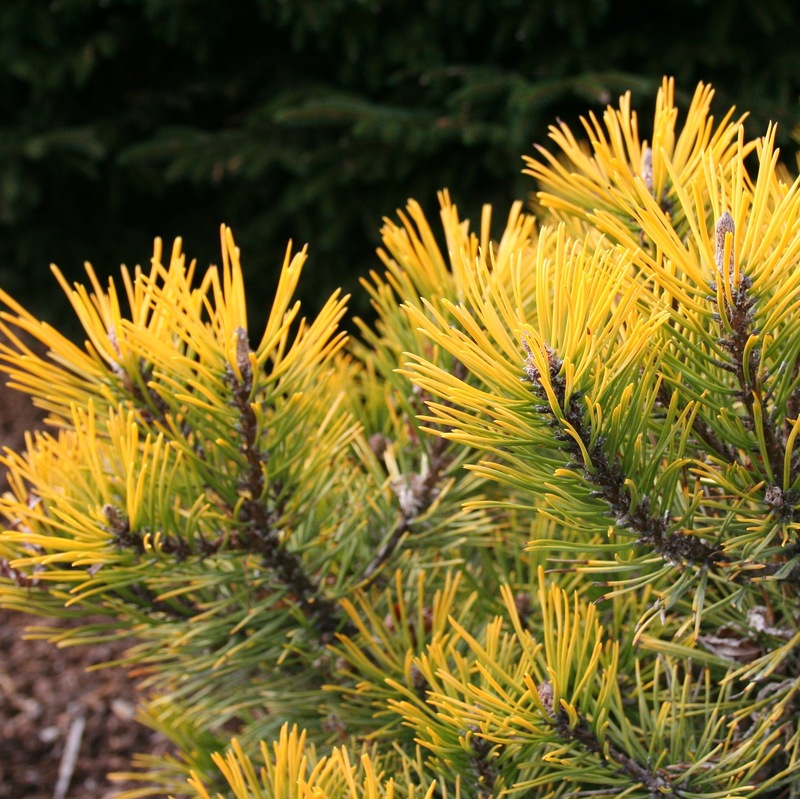 Specifically, the golden conifers. They just looked so cheerful against the cloudy sky, and all the browns and greens happening this time of year. I know some people think golden plants look sickly, but I think it’s all about placement. If you put them next to something that is just bursting with lush, healthy growth, and repeat their golden color throughout the garden, they look intentional and can add a real element of brightness and good cheer to the garden. 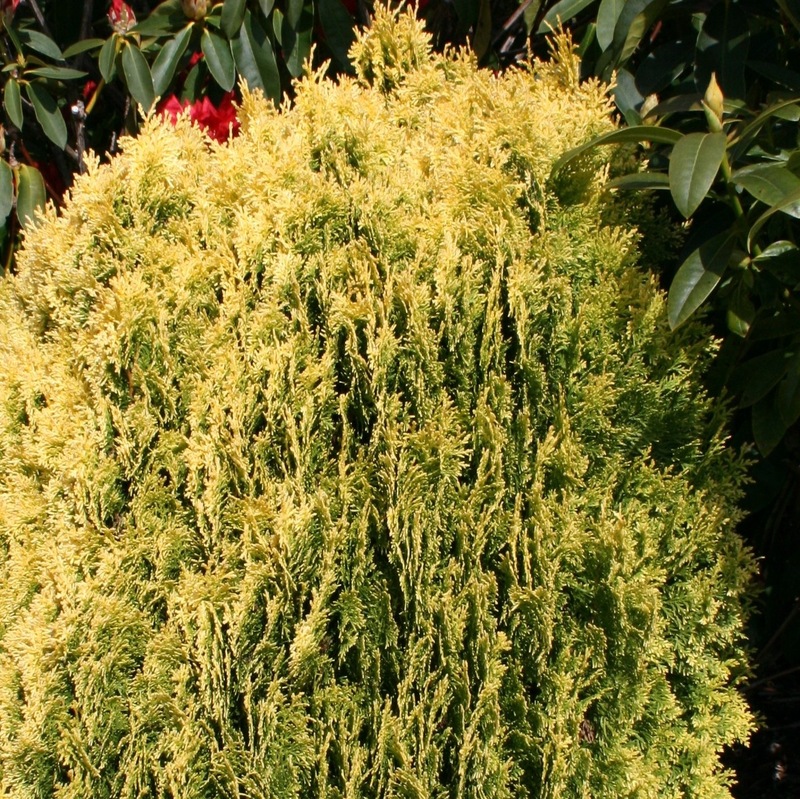 Golden Japanese cedar, Cryptomeria japonica ‘Elegans Aurea’, has a loose, cone-shaped habit. I love the weeping leaf-tips. In the photo at the top, you can see what a fun contrast it makes with the upwardly-reaching branches of Ceanothus ‘Dark Star’. The foliage has a soft appearance, but it’s a pretty tough plant; it will even take wind and salt air. It reaches about 10′ height in as many years, but it can get quite big in time, so don’t plant it under your eaves! 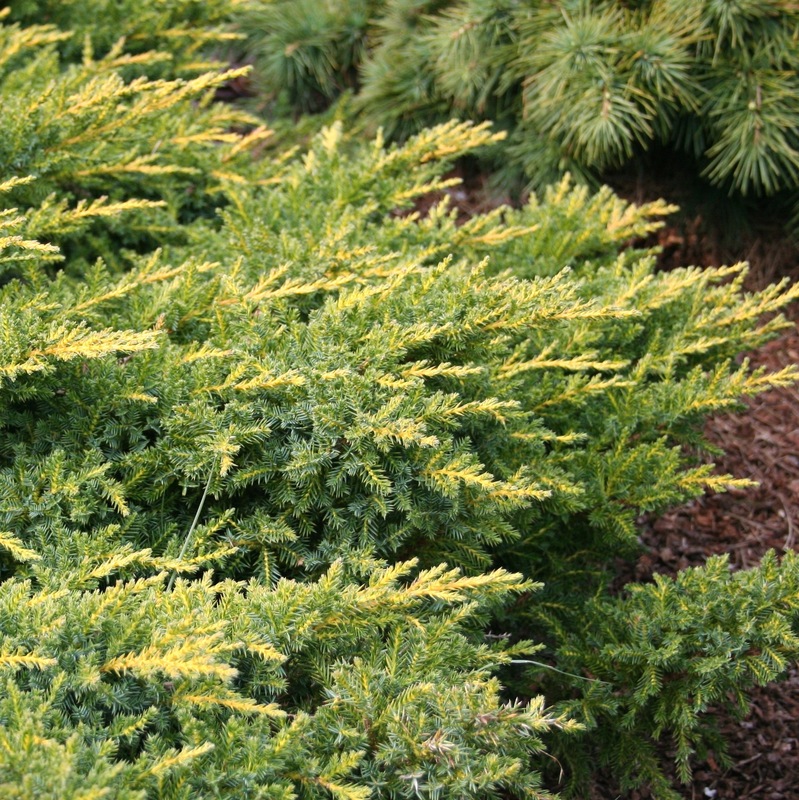 Daub’s frosted juniper, Juniperus chinensis ‘Daub’s Frosted’, grows moderately fast to about 1′ tall by 4′ wide. 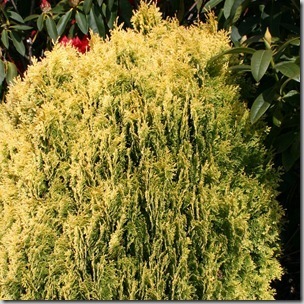 I love the creamy-golden tone to it, and while it feels hard and spiky to the touch, it has a feathery look to it that’s easy to pair with other plants. It does want good drainage and full or mostly-full sun, but if you can provide that, it needs little water or care once established. 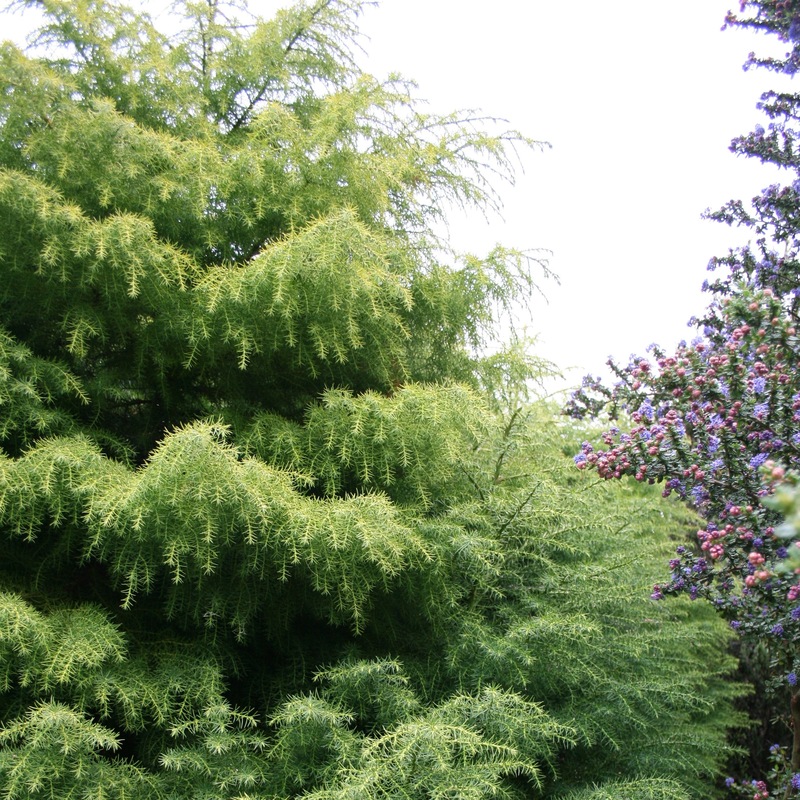 Like the Cryptomeria, it can take wind or seacoast exposure. 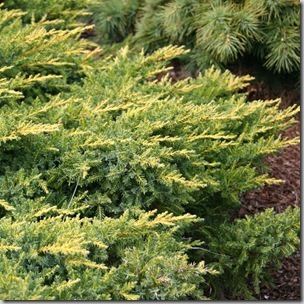 Sunlight Chinese arborvitae, Thuja orientalis ‘Sunlight’, has a sunshiney yellow color with the flat, vertical sprays of foliage arborvitaes are known for. This one grows super-slowly, only reaching about 2-3′ in ten years. 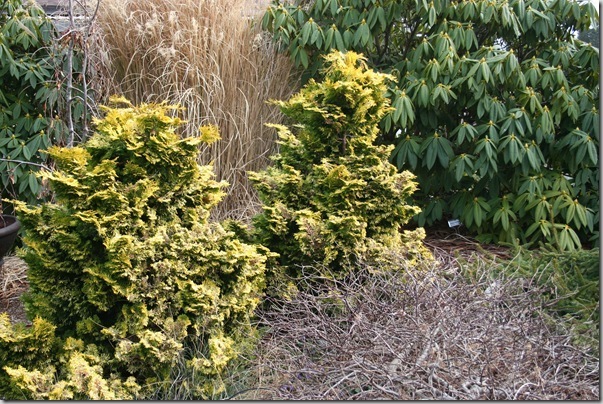 Because Oriental arborvitae (orientalis) are better adapted to dry soils than are the Eastern arborvitae (occidentalis), these guys are better suited to container culture and low-water gardens than are other arborvitaes. Amber gold mugo pine, Pinus mugo ‘Amber Gold’, is a chameleon plant, growing sedate green foliage in summer, then turning a bright golden yellow with the winter cold. It grows about 4″ per year, which means if you prune the candles back by half each year, you can keep it dwarf indefinitely. Adrian Bloom, my conifer hero, suggests planting it with bright blue grape hyacinths or with black mondo grass for a good contrast. Dwarf golden hinoki cypress, Chamaecyparis obtusa ‘Nana Aurea’, is a slow-growing little charmer. It is the brightest gold in full sun (left), but does well in part shade, too. 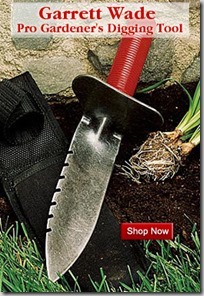 It gets about 3′ tall in ten years, and has twisted flat sprays that make a fun contrast to grasses or rounded shrubs. The only caution I’d give is that hinoki cypress are sometimes browsed by deer, so if you’re in deer-country, go with a nice pine or juniper instead. Thanks to Singing Tree Gardens for letting me wander around and take photos! If you want to read more about conifers, check out Adrian Bloom’s book, Gardening with Conifers . Bloom’s so opinionated about his conifers that the book is a joy to read, and he’s got a ton of ideas for combining them with other plants in the garden. Gen, I just love the name of that nursery – Singing Tree Gardens. 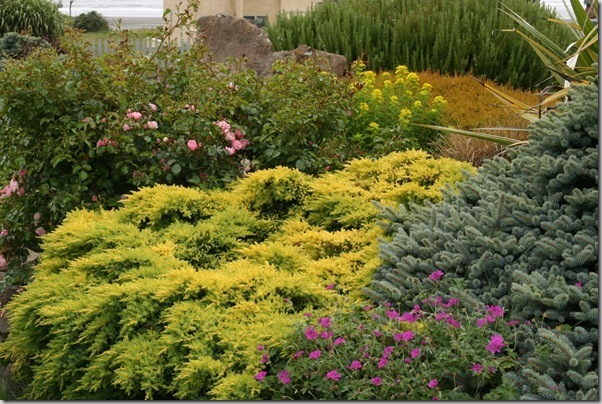 Your photos really show how easy it is to use conifers to create a colorful and interesting garden. 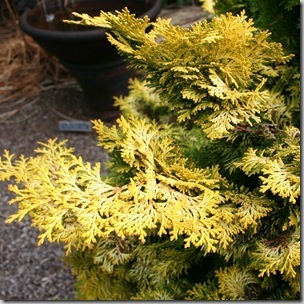 I have a thing for yellow conifers and recently added ‘Gold Cone’ juniper to my garden. It’s a good chocie for a narrow, upright accent but it does best in full sun, at least here in CT.
Isn’t that great, Debbie? I wish I’d thought of it myself. Thanks for the tip on the Gold Cone Juniper. I’m going to look that one up. I love things with a soft cone shape. Nice to be able to get a little verticality without a ton of width. 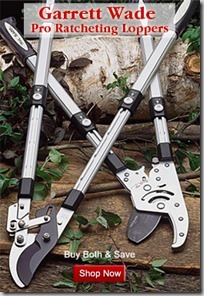 Genevieve – I am so happy more gardeners excited about conifers! 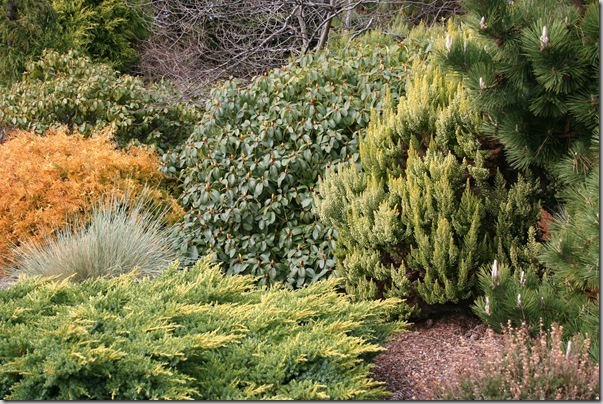 The golden colored conifers (and there are so many) really do brighten up the dark and dreary winter garden in the Pacific Nortwest where our rain isn’t just frequent, it’s dark gray. 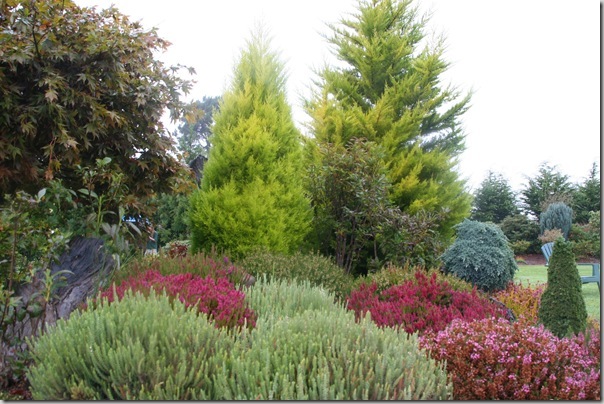 Nothing like conifers to bring brilliant color to the garden year-round! Ed – thanks for stopping by – your lovely blog is new to me, and I adore it!! What a fun writing style you have. I love Iseli nursery, too. I’ve just joined your conifer facebook group, and can’t wait to learn more about your faves. Gosh, thanks. I’m quite enjoying your posts as well! Gen, I knew if there was a blog post about conifers Ed would find it eventually:) I didn’t know Ed has a conifer FB page. I’m off to join it. Do you know why my formerly golden ‘Feelin’ Sunny’ Deodar Cedar is now green? It has been green for two years now. It hasn’t turned yellow again. It is in a pot in full sun in Seattle, WA.